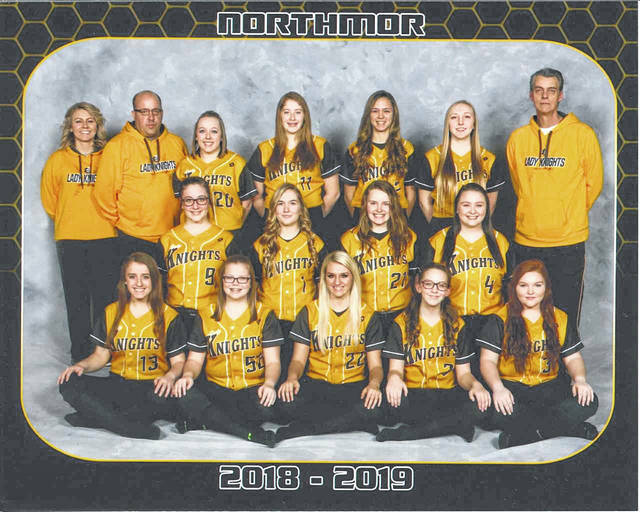 Photo courtesy of Gary Bellew, Unique Images The 2019 edition of the Northmor Lady Golden Knights softball team looks to remain competitive in a difficult Knox-Morrow Athletic Conference. GALION — Northmors softball squad will take to the diamond this season with some big fill shoes to fill, and a lot of youth. Gone are 2018 graduates Cristianna ‘Tiny’ Boggs and Kelsie Fike. “The impact on both offense and defense that those two girls brought to the game will be truly missed,” said fifth-year head coach Russ Montgomery. But Montgomery, who boasts an overall career record of 50-46, as well as varsity assistant Matt Wiseman, return some valuable experience. A pair of four-year starters will suit up: Lily Tate and Aly Blunk. In addition to their senior leadership, junior Michaela Zeger, and the sophomore pitching duo of Maddie Hoverland and Megan Adkins return in hopes of competing in a very difficult Knox-Morrow Athletic Conference. Montgomery has a strong number of underclassmen out for his squad, including sophomores Julieanne Kincaid, Rosie Sklenicka, Joycieanne Cooper, Morgan Wiseman, Megan Mcglothlin and Rylee Hollingsworth and freshmen Aliyah Martinez, Bristin Yeater and Emma Marshall. After finishing with a 13-11 overall record, including a 7-6 mark in the Knox-Morrow Athletic Conference, Northmor looks to improve this season. Cardington won the KMAC in its’ inaugural season in 2018, finishing the year with a loss in the Division III state championship game to Warren Champion (9-4). The Lady Pirates were 24-3 last year, 12-2 in the league. The season starts Saturday, March 23 with a trip to Crestline and a doubleheader with the Lady Bulldogs. KMAC play starts March 25 at Fredericktown. https://www.galioninquirer.com/wp-content/uploads/sites/38/2019/03/web1_Varsity-Softball.jpgPhoto courtesy of Gary Bellew, Unique Images The 2019 edition of the Northmor Lady Golden Knights softball team looks to remain competitive in a difficult Knox-Morrow Athletic Conference.